This superb quality range of Climadoor Roomfold Deluxe oak prefinished internal bifold doors gives you the added benefit of maintaining privacy between rooms with its frosted glass, whilst still allowing a substantial amount of light through. This range is extremely popular in refurbishments where rooms are split to give a more formal dining room one side, and a warm cosy atmosphere the other. 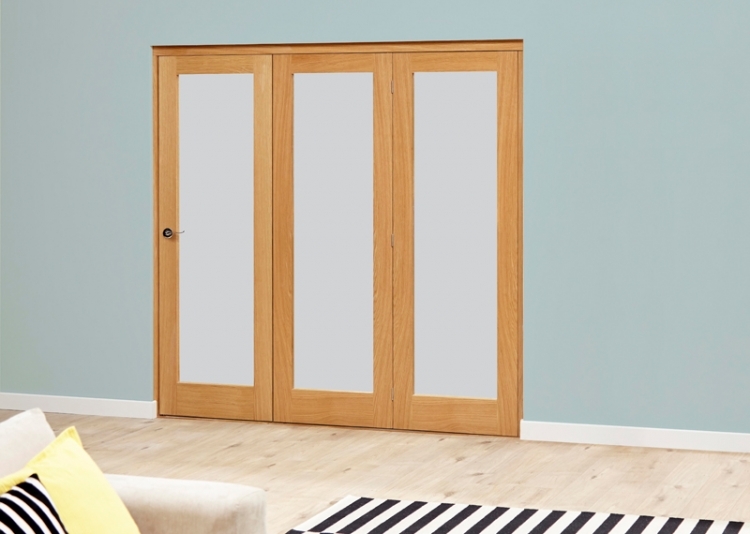 Available in 3, 4, 5 and 6 door systems, using either 533mm, 573mm, 610mm 686mm and 762mm oak glazed internal doors, you ensure that installation is made simple with no planing of doors on site and a simple installation routine to follow to assemble the doors and frame in the opening. This offers a vast range of size options for you to choose from.